BRP just released the industry’s first factory-installed turbocharged side-by-side vehicle to its 2015 Can-Am off-road line-up, the Maverick X DS model. 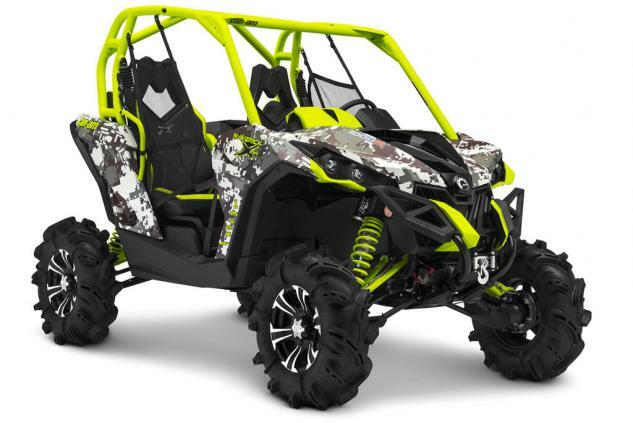 The Can-Am Maverick X ds side-by-side vehicle boasts industry-leading power with the new 121-hp Rotax 1000R turbocharged option, providing 10% more horsepower and almost 40% more torque than the closest competitor1. It also features a completely new rear end providing a longer, 88-in (223.5-cm) wheelbase, a redesigned TTA rear suspension now featuring 16 in (40.6 cm) of travel and Can-Am exclusive high performance Fox shocks to provide capability, comfort and adjustability. This model soaks up terrain and remains nimble. It is tailored to fit riders and their riding style with its premium rider-focused cockpit and ergonomically positioned controls and adjustments.